The following provides guidance on the re-covering and repair of pitched and flat roofs with regard to the requirements of the Building Regulations. New roof coverings may impose substantially higher loads on the roof structure compared to the original ones. Occasionally the new material may be substantially lighter than the original material. In both cases a Building Regulation application is required to be deposited with the Building Control Section. When the roof covering imposes higher loads the roof structure may require additional strengthening work to be carried out and could require a structural appraisal by a qualified engineer to ensure it is capable of sustaining the increased load. In older premises, typically terrace type properties, it is not unusual for the rafters and purlin's to be under sized and the roof to be inadequately braced to limit the effects of roof spread. The lack of triangulation to a roof can usually be easily identified by the construction of the roof not forming a typical triangle but instead forming a shape similar to that shown in the adjacent diagram. Where the roof timbers are identified as being under sized and or having inadequate or no measures for the limiting of roof spread, you will be required to make provisions to remediate this. The structure is usually re-mediated by with the addition of additional purlin's and the limiting of roof spread is usually achieved by the addition of ties linking the wall plates together as indicated by the bold line in the above diagram. Eaves – 25,000 square millimetres per metre run. Ridge – 5,000 square millimetres per metre run. 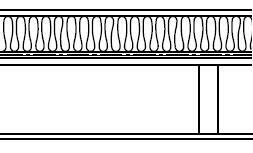 Eaves – 10,000 square millimetres per metre run. Ridge – 5,000 square millimetres per metre run, where the pitch exceeds 35 degrees and/or spans in excess of 10 metres. A 50 millimetre clear air space must be maintained between the underside of the roof and the top face of the insulation. High level – 5,000 square millimetres per metre run. Eaves – 25,000 square millimetres per metre run on opposing sides. A U value of at least 0.16W/m2K (Watts per metre squared, Kelvin) must be achieved. This can usually be achieved by a combined thickness of 270 millimetres of fibre glass quilt, this is usually laid in two layers, one layer of 100 millimetres and a second layer of 170 millimetres laid at right angles to the base layer. A U value of at least 0.18W/m2K (Watts per metre squared, Kelvin) must be achieved. Where the rafters are deep enough the current standard should be met, this can usually be achieved by 165mm of Polyisocyanurate (PIR) rigid insulation, however a 50 millimetre air gap must be maintained over the insulation for air flow and therefore this can only be achieved with 215 millimetre deep rafters. Where the current standard cannot be achieved by this means or by alternatives such as insulating above the rafters, a lesser standard may be accepted to achieve the best possible level of insulation whilst maintaining the required mandatory air gap. This is usually achieved by altering the roof to a warm deck construction typically by applying a 126 millimetre layer of a Polyisocyanurate (PIR) type insulation above the joists and then applying the new weathering layer. 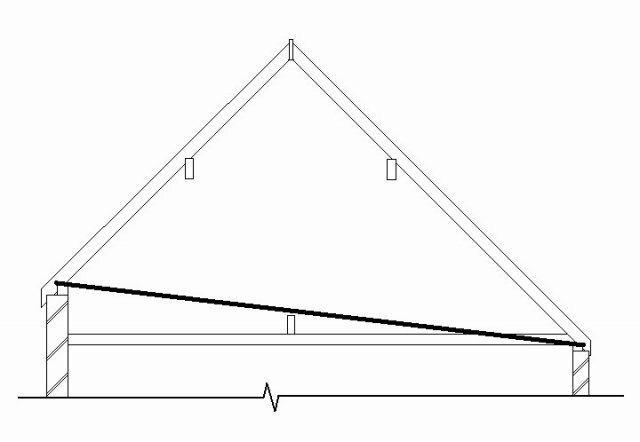 In exceptional circumstances where a warm deck construction is not possible, you may be permitted to install a reduced thickness of Polyisocyanurate (PIR) type insulation between the joists but a 50 millimetre air gap must be maintained over it, where this solution is permitted the roof ventilation will need to be checked and increased to the levels as shown above for a pitched roof with a pitch of less than 15 degrees. For example, 215 millimetre deep joists would require the maximum depth of 165 millimetres Polyisocyanurate (PIR) type insulation with a 50mm clear air space above. As of the 15 July 2010 the definition of 'renovation' in regulation 2(1) of the Building Regulations 2010 has been amended. This means for example, that the repair of a flat roof by the addition of an additional layer to the existing roof by the laying of a liquid sealant to the roof surface or a new layer of felt will no longer fall within the definition of 'building work' in regulation 3(1) of the Building Regulations as it is a repair not a renovation and as such will no longer be notifiable building work. Please note that this change does not affect the current position in relation to pitched roofs or where flat roofs are altered by the removal and replacement of a layer or layers. 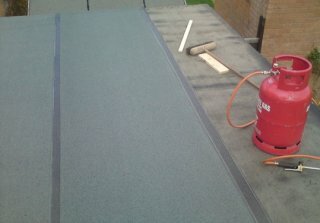 However where a roof is altered by the removal and replacement of at least 25 per cent of a layer or layers this work is considered to be a renovation and is therefore classed as building work which remains notifiable and requires a Building Regulations application to be deposited unless your chosen contractor is registered with Competent Roofer the competent person scheme for roofing works in which case you will not need to apply for permission from Building Control as the installer will notify their competent person scheme provider, who will in turn notify us. How do I make a Building Regulations application? There are several different types of Buildings Regulations application that can be made, however they are not all suitable for every situation. There are three ways in which applications can be made to the Council. Please note that when submitting a Building Regulations application a fee will be payable, more information on our fees can be found within our schedule of charges. Where can I find the application form to submit my Building Regulations application? All of our application forms and our scales of charges can be found on our forms and fees page. This page also has many other sources of information in the form of leaflets that may help you with your building project.